Avalon is one of the leading and most in-demand DJ/Producers in the Psychedelic trance scene today. After a decade of consistently topping the charts with his innovative style, Avalon has had Ten Psy-Trance number 1 hit’s on Beatport and Three number 1 selling albums, totalling 6 albums under his belt. 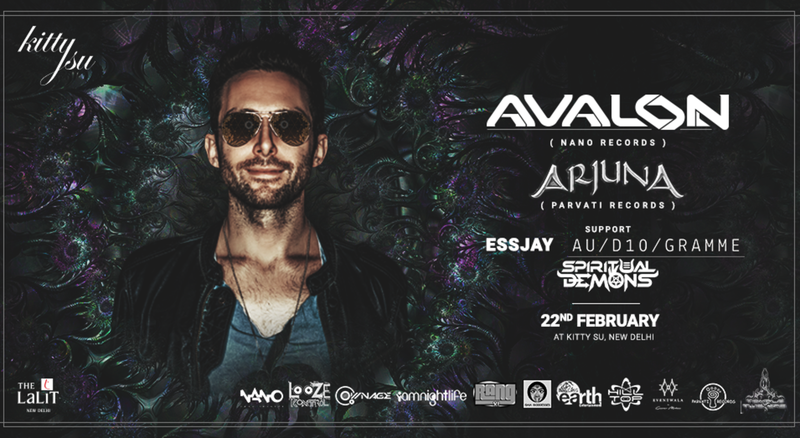 He is one of the top headliners at most major psychedelic trance events around the globe. In the studio he has worked with Tristan, Astrix, Burn In Noise, Vini Vici, Ajja to name a few. EDC Las vegas, Ministry of Sound, Burning Man, Tribe, Dreamstate USA, Exit festival, Glastonbury, Sunburn, Ultra, Green Valley (Brazil), Rainbow Serpent, EVC India (Enchanted Valley Carnival), Symbiosis, Atmosphere, Time and Space, Gatecrasher, Universo Parallelo, Xxxperience, BAT, Antaris, Origin, and the list goes on. Last year Avalon had the honor of playing the opening Trance set at Ozora with a 2 hour liveset. Also playing the last day sunset slot at Boom festival was another highlight of his career . Avalon's collaboration projects have also garnered mass appeal having produced two successful albums with Dj Tristan under the project name ‘Killerwatts’ and one album with Sonic Species under his progressive alias ‘Future Frequency’. He has also had a number 1 hit on major label spinnin records. Avalon is currently working on a new solo album and a string of new releases and remixes for all of his projects, many of which are set for release soon!